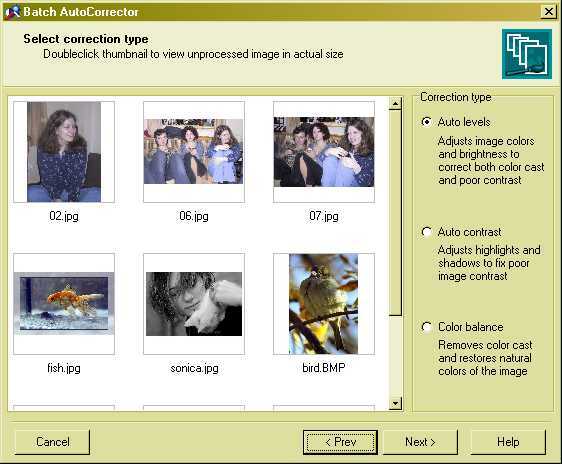 Batch AutoCorrector will enhance your digital images automatically! Whether it is due to poor lighting or camera settings, images often lack contrast, have an unwanted color cast or "muddy" look and dull appearance. Batch AutoCorrector is a powerful image processing program that provides a quick and simple way to solve each of these problems, allowing correction of multiple images with just a few mouse clicks. Batch AutoCorrector is an ideal tool for pictures that need overall contrast or color correction, e.g. shots taken in poor lighting, at sunset, under fluorescent lights, etc. The program boosts contrast, increases color saturation and removes color casts, improving the overall appearance of images. Batch AutoCorrector helps produce richer colors in photos that seem desaturated, dull and lifeless in color, fixes poor image contrast by adjusting highlights and shadows and removes color casts, restoring image natural colors. The program uses a wizard-style approach that guides the user through the image correction process and makes it fast and simple. Autocorrection features include the: "auto levels" correction, "color balance" correction and "autocontrast". On the whole, Batch AutoCorrector features make it an indispensable tool for digital camera owners and an excellent program for novices and experts alike. VicMan Software, the leading digital imaging software developer, gives you this product for free.